It's most often that we start to miss and treasure places only when we hear of them being on the verge of vanishing. 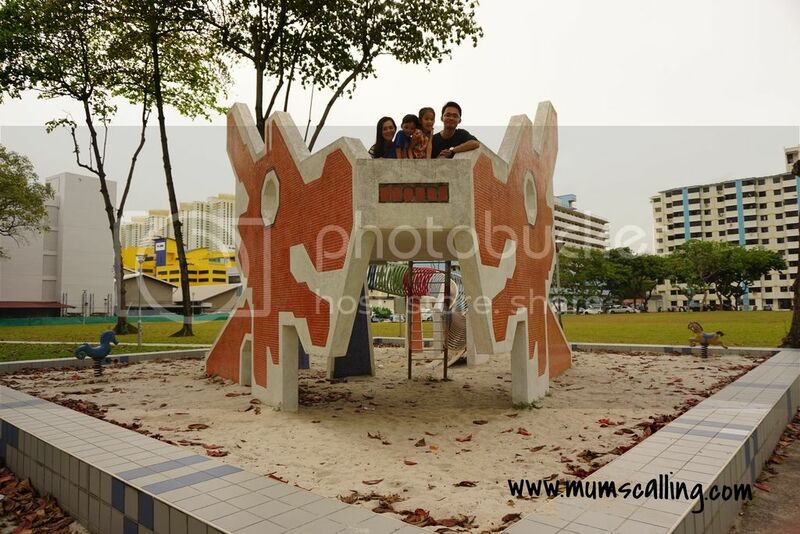 We had always wanted to visit some of the still existing heritage playgrounds and had recently got it checked off our list. 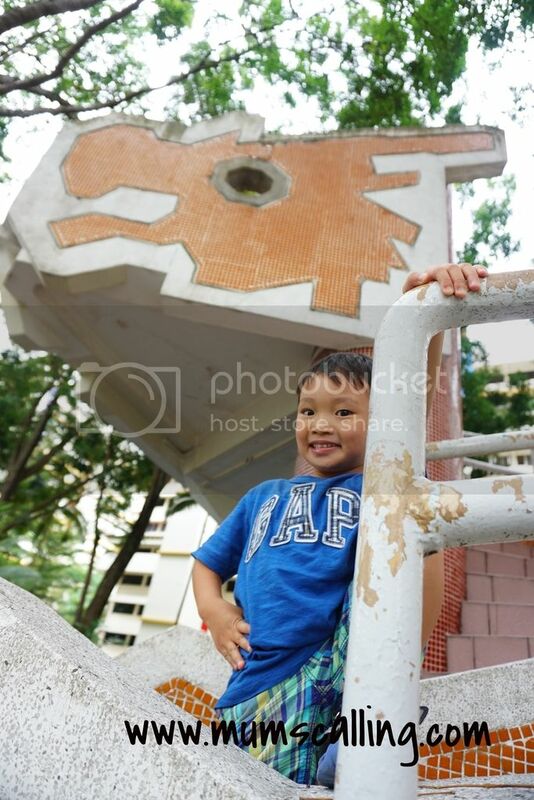 In view of SG50, A juggling mum had initiated a blog series of heritage playground among fellow Mummy bloggers. I am very excited to share our contribution on this. If you lived as a kid in the 80s, Heritage playgrounds might be looking very familiar to you. 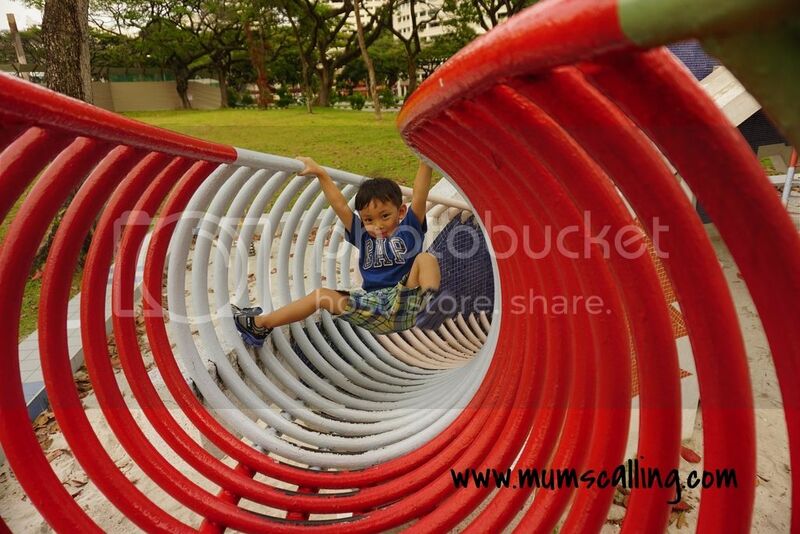 Specially the dragon playgrounds that are now iconic to most Singaporeans. 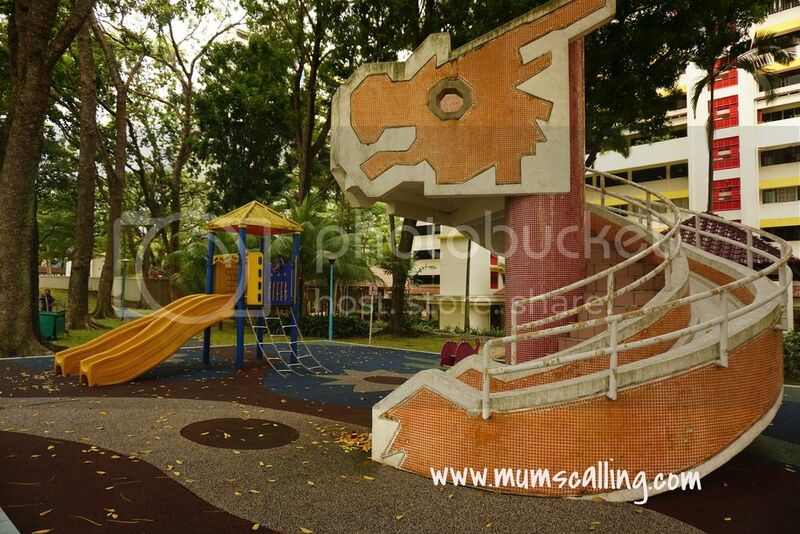 Not many left, but we've recently set foot in the baby dragon playground at Toa Payoh. This friendly baby dragon, not standing it's full size is now co-existing with a new generation playground just next to it. Looking like a play battle of the now and the older generation kids, I've to say they didn't really blend well standing side by side. It's perhaps true when we say there's a big gap missing between generations. Don't get mad if our kids don't understand us. We might not quite know them well too. After all, we've been on different playgrounds. This orange baby dragon playground that's being densely surrounded by built up flats, seemed rather abandoned on the weekday evening we visited. There were fallen leaves all over the vintage steps and slides. You can see them on the rubber flooring too. Nonetheless, we swept them off the dragon to have some play on it. We were surprised that this friendly dragon first appealed to Js instead of the modern structure next to it. I chuckled at their refreshing choice of play. They had fun simply by climbing to the top of the mini dragon and wading down the gentle winding slide. Just like this, they knew it was something different from their usual playground. Yeap, that's the type of playground your mama and papa went on in the past. We didn't stay too long, had some pictures and play with it then left. Honestly, fun factor wasn't that great on the baby dragon. Since we were in the vicinity of the iconic full bodied dragon, also in Toa Payoh, we knew visiting it was a must for a higher fun factor. It wow-ed the kids! Dragons are always impressive huh. Something of the past may be nostalgic to us, but definitely new looking to the kids of now. Needless to say, this was where they spent most time getting adventurous with. The blocks of flats that guarded around it had been demolished. This tough standing playground is mostly likely to stay. Standing alone, it really is looking more majestic than before. As a parent of today, I wondered how did we, kids of the past adventured on these playgrounds. I went on the steps and found them really steep, went on the dragon's body and found myself struggling with height phobia. I couldn't imagine my man telling me he jumped off from the highest point when he was playing catching with his friends. Oh my! Significant difference between the playing journey of the past and present. It looks like we aren't giving our kids of now enough room for adventure. Still, where adventure is, safety must be present. I guess that must be one of the reason why these playgrounds are being phased out. Oh well, there are more playgrounds of yesteryears awaiting our discovery. Some may have vanished and some are staying strong. Treasure the past and present, while they last.